Property 1: Evita's Home, ideal for families & friends with breathtaking sea view! Sea-esta Beach House, right on the beach, car-free vacation! Property 7: Sea-esta Beach House, right on the beach, car-free vacation! Property 20: Dim Art Stone House. A lovely nest set in an alley of Lefkogia village, 2km away from 4 beaches! Property 26: A lovely nest set in an alley of Lefkogia village, 2km away from 4 beaches! Property 32: Water front apartment, great sea views, walking distance to the beach & shops! 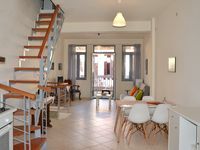 Property 39: Casa Dorata: Quiet, unique beauty at a picturesque village close to Rethymnon. Property 44: Askoutsi Manor! Unique manor with Jacuzzi terrace in a country side village!